We couldn’t help but fall in love with the CBDfx CBD balm. It smelled wonderful, felt even better, and did the job we expected. Every one of us that tried it had success with treatment and it the effects stuck around longer than other CBD topicals we had used. It worked extremely well as a CBD pain relief rub and as a CBD muscle rub. 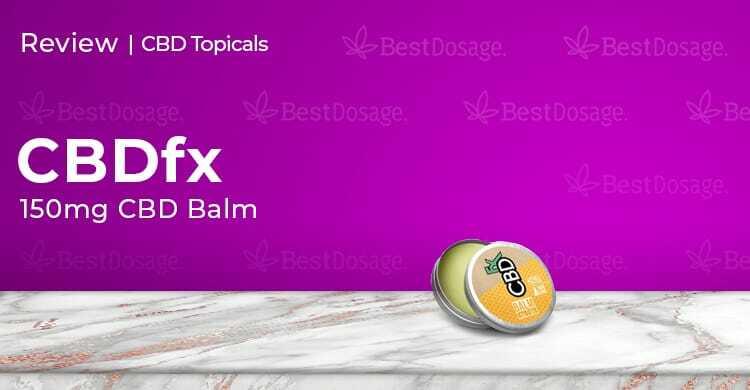 The brand new CBDfx CBD balm product is the latest CBD topical by the well-known company. We had tried the CBD cream already too great success and were curious as to how it might compare to this new CBD oil balm. CBDfx offers a wide range of products. Their roots are in vaping, but they’ve quickly branched out to create other high-quality CBD products, like gummies, vape pens, and topicals. CBDfx has been around since 2015 and is known for being a brand that is serious about their products’ quality as well as their customer service. The CBDfx CBD balm is a topical product meant to be applied directly to areas of your skin that need relief. In addition to the 150mg of full spectrum CBD, it has other beneficial ingredients such as lavender flower oil, tea tree oil, jojoba oil, shea butter, and others. It also contains vitamin E, which promotes strong immunity and healthy skin. Currently, CBDfx CBD balm only comes in a singular 2 oz canister size. At first glance, the canister looks like many others that we’ve tried. Whether it’s a CBD balm, a CBD rub, or other CBD topical, this is a popular way to package it. Of course it has the professional looking CBDfx labeling on both the top and the bottom of the tin canister, but otherwise nothing special here. The label lists the full ingredients and anything you need to know, plus it has a QR code for their lab reports. You can use your phone’s QR reader and it will direct you to download CBDfx’s lab reports, which was a nice addition. After messing around with the QR code, we were ready to open this baby up. The cap was a nice snug fit, but once opened we whiffed our first scents of the CBD oil balm smells. We loved it! It was a light honey smell that kind of reminded us of Burt’s Bees lip balm, but it has an infusion of lavender too. It wasn’t overpowering, but it was definitely a pleasant aroma that added to the overall quality feel of the product. Since you’re probably taking this as a CBD pain relief rub, you’re going to want to apply it directly to where the pain is and then give it some time. The effect of the CBDfx CBD balm often sets in instantly, but give it 15 minutes or so just in case. If it isn’t enough, rub in some more of until you find the right level for your needs. This CBD oil balm lasts quite a while. The brand lists 4-6 hours as an estimate and that’s more or less what we experienced before its effect began to fade away. Before the CBD itself starts to do its thing, there was an effect on how it was felt. For everyone on our team, the feel of it on our skin was at first cool and refreshing, and then moments later a slight warmth crept in which felt rather comforting. Not long after that, the therapeutic effects of the CBDfx CBD balm set in. Each person on our team had a different ailment they were trying to treat. Mostly it was pain but in different areas. This balm worked great for that, similar to the way a good CBD cream for pain would work. We saw success with both acute pain and non-acute but chronic pain. It also doubles as a CBD muscle rub being that it is oilier than a cream but not too greasy. Working it into someone’s shoulders after a workout, for instance, made a huge difference in recovery. A couple people on our team also used it for skin issues like eczema and psoriasis. With those, the results obviously weren’t immediate, but after treating it with the CBDfx CBD balm daily they saw improvements after about 10 days. This is a quality brand as such, you would expect great customer support. They certainly deliver and give you a variety of contact options too. Whether it is email, live chat, or their toll-free number, you’ll get a quick response and their staff is always super helpful. An extra tip? Try writing them on Instagram! They’ll get back to you just as quickly and you can do it right from your app. Free shipping on all orders in the USA – can’t beat that! Plus, CBDfx also offers a great tracking system so you’ll always know where your order is and what is expected to arrive. Not to mention the job it did on skin conditions. This is truly a multifunctional product. It can even be used as a CBD lip balm! If we had to pick something we didn’t like, it would probably be the price. $39.99 isn’t outrageous by any means, but it is on the higher end of the price per mg of CBD scale for CBD oil balms. That being said, it works amazingly well and the effect sticks around for longer than most, so it balances out. This is a high-quality product that is definitely worth it regardless, and we recommend it highly.